In our previous post, we review Vitality Air Canned Air Bottles from Canada. This product did not generate much interest for the obvious reasons. No one would want to spend a penny for something like Air! Canned Oxygen is different than Air. It provides comfort to people with medical conditions of lungs and in general. Canister form-factor oxygen from Boost Oxygen is very popular and a Best-seller. This Boost Oxygen Review would help you learn more about it. 1 What Is Boost Oxygen? 3 How Much Does A Can Last For? 95% pure oxygen filled in cans available in 2 litre(pocket size), 5 litre(medium) and 10 litre(large) sizes. A few puffs of Boost Oxygen can be a life saver. Boost Oxygen is the Perfect way to energize and optimize your workouts as inhaling supplemental oxygen increases performance by upto 25%. It also reduces post workout recovery times. Unlike Caffeine and energy drinks, Boost Oxygen helps restore your energy in safe and non-prescription form. 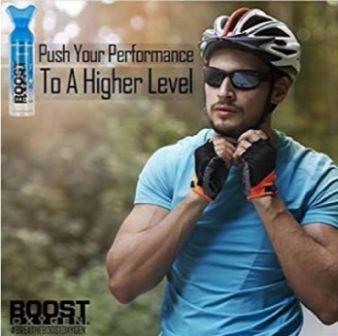 Boost Oxygen helps the symptoms of oxygen depletion in the blood especially on high altitude terrains. Check your O2 levels with pulsox to determine blood oxygen levels. People have reported respite when hiking at thousands of feet above see level where oxygen is scarce. A few inhalations can maintain oxygen to good levels for about 5-10 minutes. Definitely works to increase oxygen level in blood and can help non-acclimatized people get rid of headaches almost immediately. Boost Oxygen can be a life saver and will immediately (temporarily) relieve dizziness and elevation sickness. COPD patients who suffer with many scary flare-ups can benefit from this product. The BOOST Oxygen cans are not a replacement for supplemental oxygen. Its best practice to exhale two times very deeply (if time and health permit) then draw in on the BOOST while inhaling. Keep the oxygen in your lungs as long as comfortable then exhale. Repeat once or twice. Asthma patients can use Boost Oxygen as a supplement along with the regular inhalers. People experiencing Heart palpitations or elevated heart beats can also benefit from Boost Oxygen but only as an emergency. How Much Does A Can Last For? A 5 litre Boost Oxygen Can can last for about 100 1-second inhalations. Check cost. The product is reasonably priced, especially for people who do not intend to use it much. There are no similar products on the market for price comparison. This product is also available in bulk, which will save on cost per can. The containers themselves are very easy to use. You simply put your face over the well-fitted face piece and hit the trigger button. This will release a blast of pure oxygen. You can hold it down for a longer burst, or use it in a quick trigger motion for multiple bursts. One or two second inhalations are sufficient. It is always subjective when it comes to determining the effectiveness of any product. Still, Boost Oxygen Cans can provide instant relief in situations where being able to breathe is the only thing you want. Oximeters can be used to gauge oxygen levels before and after inhalation of oxygen. Reviewers have reported a jump of few points which sustains for 5-10 minutes. This is a great item to take along on hikes as it is not particularly large (assuming you have a proper backpack). It is handheld, but not something you simply want to hold all day on your hike. It would store easily in most packs. The container itself is sturdy enough that it will survive being dropped, albeit with a possible ding or two. The can weighs as if its empty. The reason is simple chemistry. Oxygen is nearly as heavy (or rather light) as air. No extra weight for you to worry! Pocket Size (2 Liters): Up to 40 one-second inhalations. Medium Size (5 Liters): Up to 100 one-second inhalations. Large Size (10 Liters): Up to 200 one-second inhalations. Boost Oxygen is a premium product with millions of happy users. If there really is a need for you to get supplemental oxygen to your rescue then Go For Boost Oxygen with full trust, No Problem!